This proposal aims to elucidate the environmental history of Lake Qarun and to identify human impacts using a combined approach of time-space analysis. This important site potentially holds one of the world's longest environmental change records resulting from the impacts of both ancient/modern civilizations and climate. It is funded by the Leverhulme Trust (Research Project F/07 134X) and is active between Feb 2003 and Jan 2006. Click here for more details. The work is being co-ordinated by researchers at the Environmental Change Research Centre and Institute of Archaeology at University College London and involves scientists in UK and Egypt. Click here for more details. Natural archives of past environments, such as lake sediments, offer a valuable resource for examining the nature of the interactions between Man and the environment, especially in regions where ancient civilizations developed. When Herodotus visited the Faiyum in about 450 BC he encountered a large lake, the Lake Moeris of antiquity. He described it as being 50 fathoms deep and maintained by a seasonal supply of Nile water. Click here for more on the history of the Faiyum Depression. This proposal aims to elucidate the environmental history of Lake Qarun and to identify human impacts using a combined approach of time-space analysis. This important site potentially holds one of the world's longest environmental change records resulting from the impacts of both ancient/modern civilizations and climate. Until about 4 KY BP, we believe the Faiyum region was mainly under climatic control from Nile floods and local climate. Then the impact of civilization through land and water management became increasingly important. Recently (20th century), technological changes have dominated the lake but the extent, pace and nature of ecosystem change in the Faiyum during the Holocene is largely unknown. Click here to see a diagram of inferred lake level changes. Lake Qarun's sedimentary archive will potentially reveal environmental change records on several time scales, ranging from slow geological processes, through agricultural development, to abrupt climate change. Nevertheless, disentangling sediment records of cultural and climate changes represents a major challenge. (iii) independent palaeoclimate records from East Africa and the eastern Mediterranean where human activity has been low. 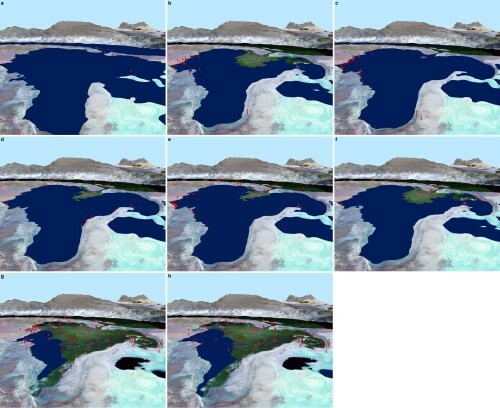 Making time-space comparisons using this combined approach should enable accurate and attributable environmental change reconstructions for the Lake Qarun region. Lake Qarun occupies a key location on the PAST GLOBAL CHANGES (PAGES) IGBP Pole Equator Pole (PEP III) Transect - an initiative which aims to produce a coherent quantitative record of the earth's environmental history. Results of this project will contribute to the global time-space environmental change data bank currently being assembled internationally by PEP III working groups. The environmental history of Lake Qarun is also relevant to current African palaeoclimate projects (ACACIA and IDEAL). Geoarchaeological evidence indicates that the lake was impacted by a remarkable combination of climatic and human factors during the Holocene epoch and includes former beach deposits and now terrestrial freshwater diatomites (dated to 7000-5000 years BP). Civilization in the Faiyum was primarily based on the water and land resources around the freshwater lake fed by the Nile. The oasis has been extensively occupied since Prehistoric times and was the arena of major achievements by a succession of Pharaohs. Historical evidence indicates that after 4.2 KY BP, an episode of dramatically low Nile floods caused the collapse of centralized government and 140 years of chaos and political disorder (The First Intermediate Period) ensued. A major water project was undertaken to restore Nile water to the Faiyum and the region recovered. This was one of the earliest massive national hydrological projects in the world. The 12th Dynasty kings responsible were Amenemhat I-III and they acquired the title of 'engineering kings'. The rise to fame of the Faiyum at that time was celebrated by Middle Kingdom Pharaohs who chose the area for constructing impressive pyramids at Hawara and Lahun. Excavations by Petrie (UCL's and Britain's first Professor of Archaeology) revealed the grandeur of Egyptian civilization in this period. Political and societal changes in the Faiyum continued and during the Ptolemaic period (beginning ~2.3 KY BP) the lake level was artificially lowered to reclaim land for agriculture. This activity persists to the present. When Herodotus visited the Faiyum in about 450 BC he encountered a large lake, the Lake Moeris of antiquity. He described it as being 50 fathoms deep and maintained by a seasonal supply of Nile water. In the late 19th and 20th century, archaeologists (Flinders Petrie, Canter-Thompson, and John Ball) showed that modern Lake Qarun is indeed the shrunken remnant of Lake Moeris. Today, Lake Qarun is the only natural contemporary lake in Middle Egypt. It is currently 8 m deep and 44 m below sea level, is saline and receives drainage water from the Faiyum but has no surface outflow. The Faiyum is now an intensively agricultural region supported by abundant freshwater from the River Nile via the Bahr Yusef canal. Inferred changes in the level of Lake Qarun during the Holocene mainly according to geoarchaeological and geomorphological evidence. See this paper for a full description of the work: Hassan, F., Tassie, G., Flower, R., Hughes, M. & Hamden, M. (2006) Modelling environmental and settlement change in the Fayum. Egyptian Archaeology 29: 37-40. 26 Bedford Way, London WC1H OAP. 31-34 Gordon Square, London WCIH OPY. Allegaten 41, N-5007 Bergen, Norway. University College London, 26 Bedford Way London, WC1H OAP. The ECRC is one of UCL's many inter-disciplinary research centres. Its work is concerned primarily with aquatic ecosystem change and climate change on a range of time scales, past, present and future. The Institute was formally opened in 1937 as a centre for teaching and research in archaeology. Today, it is one of the hubs of archaeological activity in the world, offering a broad variety of undergraduate and graduate degree programmes and undertaking wide ranging research. The Petrie Museum today houses an estimated 80,000 objects, making it one of the greatest collections of Egyptian and Sudanese archaeology in the world. The Trust, established at the wish of William Hesketh Lever, the first Viscount Leverhulme, makes awards for the support of research and education.